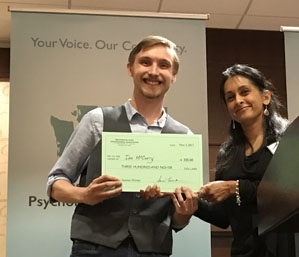 Washington State Psychological Association will include a student poster session at the 2018 Fall Convention at the Hilton Hotel in Bellevue, Washington, on Friday, November 2, 2018. Students must be WSPA members to submit a poster. Student membership is $35, click on this link to join WSPA. WSPA Student members can Submit their poster proposals here. This award is sponsored by past presidents of WSPA. The WSPA Poster Committee will recognize the student who presents the most outstanding poster with the WSPA Presidential Student Poster cash award. Second and third place posters will receive gift awards. The award will be presented at the Friday evening Annual Meeting at 5:30. The majority of the work and thought has been completed by student presenter(s). The poster demonstrates work that is recognized as a notable contribution to the profession of psychology. The poster will be evaluated for both the content (i.e., originality, focus, relevance to the profession of psychology, etc.) as well as for the design qualities of the poster (i.e., readability, appeal, graphics, etc.). The student who is the primary author of the poster will receive the recognition and monetary award, but this award can be shared by multiple presenters as desired. Interested students must be WSPA members and need to login to their account to submit a poster application and abstract. If you are not a member, our annual student membership is $35 and you can join WSPA here. Poster session applications must be received by the WSPA office NO LATER THAN Friday, September 28, 2018, 5pm PST. Please log into your account to submit your application online. All poster session applications will be reviewed on a rolling basis by the WSPA Conference Programming Committee. The primary presenter will be notified no later than Friday, October 12th, 5pm PST of their proposal status. Presenters will also need to register for the conference in order to present their posters, and can register for Friday only, or Friday and Saturday, at reduced WSPA student member rates here (note, convention rates include lunch). Preparation of Poster: Printed posters should be in a landscape format no larger than 60" wide x 42" tall (5' wide x 3'5" tall); push pins to secure the poster to the board will be provided. Please ensure that the poster clearly lists student presenter(s) and sponsoring professors/instructors. Presenters are responsible for copying any handouts/presentations for distribution to session participants. Set up: 8:00 am - 9:00 am.